Many Berkeley Street residents rely on the parking lot at the end of the street because their homes do not have driveways. Often people going to Filippello Park are parked in the spots, too. 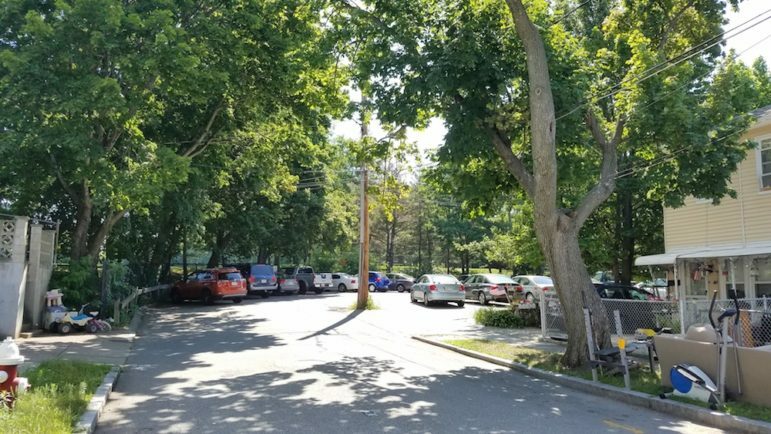 Residents of a small neighborhood tucked off Arlington Street near Filippello Park seek relief from scarcity of parking and other problems associated with a gate leading to Filippello Park. Tuesday night the a joint meeting of the Town Council’s Public Works and Human Services Committee met to start the process of finding a solution for the problems of residents of Berkeley and Clarendon streets. The problems date back to 1999 when a gate was opened giving the public access to Filippello Park near the area where the two streets come together at a parking area, known as Glen Circle. Complicating matters, most residents of Berkeley Street do not have parking because their homes are row houses which have no driveways. This causes parking problems in the summer and the winter, said Stratos Stylianos, who lives on Berkeley Street. In the winter, because people can’t park on Berkeley Street there is not enough parking in the parking area. In the summer, the parking lot is filled with people using the park for sporting events, parties and other reasons. Also, people speed along the streets to get to the gate. Flora Rosati, a Berkeley Street resident, brought a petition signed by 40 people asking for the Town to close off the gate to Filippello Park at Glen Circle. She said there are many problems facing neighbors. Others thought that the Town should limit parking in Glen Circle to people who live on Berkeley and Clarendon streets. Residents thought that there is enough parking in the new parking lot at Filippello Park off Grove Street. That would reduce the amount of people parking in Glen Circle. 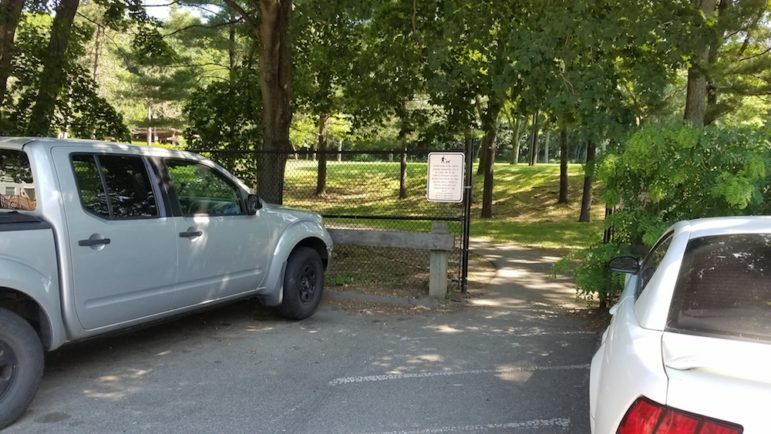 The gate near the parking area at the end of Berkeley Street has become a favorite place for Filippello Park users to park. East End Town Councilor Angeline Kounelis noted that there had been a plan at one point to line spaces on Glen Circle, one had 31 spaces and the second 41, with 26 double stacked spots. Currently, however, as many as 60 cars park in the area, Kounelis said. Kounelis added that if there is illegal dumping at the park, residents should contact the Department of Public Works or even call her to report it. Town Council Vice President Vincent Piccirilli, who chairs the Public Works Committee, said that the subcommittees will hold meetings until they come up with the best solution. “I guarantee we are not going to make everyone happy, but we will make the most people happy and the least amount unhappy,” Piccirilli said. The next meeting on Glen Circle will be held on May 6, 2019 at 7:15 p.m.